I’ve never been one who photographs in colour and occasionally dabbles with black and white. It’s very much the other way round, and I often look at pictures I’ve left in colour and think they’re rather monochrome anyway. But I’ve never seen doing a lot of b&w work as a reason why I would want to buy Nik’s Silver Efex Pro (SEP) or any of the other dedicated black and white plug-ins that it has now overshadowed. It’s not that I felt SEP1 deficient in any way – quite the contrary. SEP1 was a very polished piece of software, produced good results quickly (even if I doubted the film simulations), and I could certainly see why people liked it so much. I simply felt its price was steep, and I’ve not feel any real need for it. 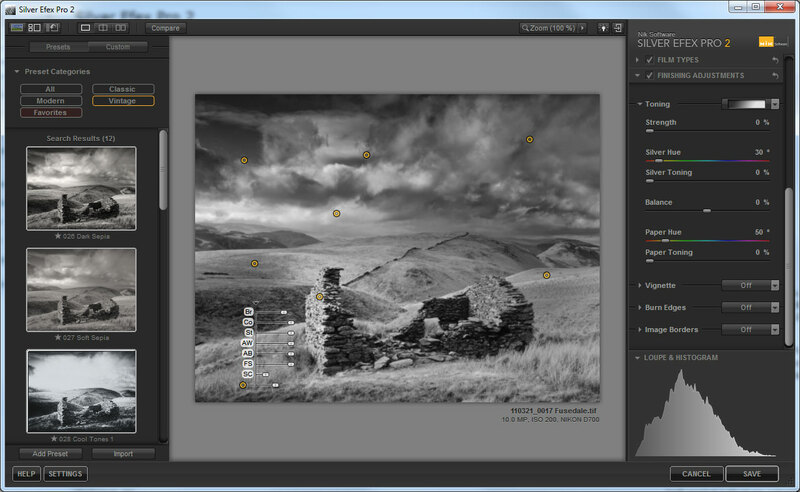 As before, it’s a very easy program to use – installing as a Photoshop, Lightroom or Aperture plug-in. You then launch SEP2 from the host program (though you can drag a TIF or JPEG onto the program icon or desktop shortcut) and it is converted to black and white with a default treatment. On the left are the presets, both built-in and any user-created, and I liked how they are shown as thumbnails or “visual presets”. It uses a lot of space, but that isn’t a problem with a dedicated app like SEP2, and it is much better than listing presets in text-only form or than Lightroom’s combination of list and rollover image. You can have too much of a good thing though – after a day or two I realised that the preset panel was leading me to work by clicking one preset after another, before doing anything else to the image. It was a very grave case of “presetitis”, at least as severe as anything Lightroom could inflict! I wasn’t just exploring alternative treatments but felt I was working by trial and error. I felt so much happier once I had hidden the presets from view! I’d also apply that argument to the film recipes, of course. I’ll restrict my rant to asking what’s the creative value of someone who never used a particular film stock being led to believe in a recipe that doesn’t include variations such as development methods, enlarger and paper types? 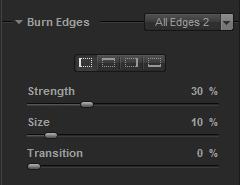 One thing I didn’t notice at first was how the edge burning could be varied on each side. It was a bit like having 4 ND grad filters around the image and was a nice touch. The selective colour adjustment allows you to preserve the colour in parts of the image. I used to enjoy painting on b&w prints and have occasionally done it in Photoshop, if not for a while, and I’m sure this feature will be popular. It seemed to work best for me when applying SEP2 to a Photoshop smart object – I could keep make multiple trips to SEP2 and the colour and the U-points remained editable. However, if I started from a regular layer or from Lightroom, the file would be saved as a simple TIF file, and any coloured patches would be lost if I re-opened that file in SEP2. The same happened if I added a tone and then re-edited. So smart objects would definitely be the way to go. Have I changed my mind about Silver Efex? Not quite. It remains a very pleasant app to use, just one that costs more than I’m likely to pay for something I don’t really need (though that didn’t stop me ordering a Lee Big Stopper recently). Overall, I liked Silver Efex Pro 2 and I would perhaps consider getting it – at least as part of the Nik suite. But I don’t do colour, do I? I had not noticed the keyword problem, until I read this, but yes, it’s on mine too. It looks like they are taking it seriously. Yesterday there was an update of their HDR program which, according to their Marketing Mgr, addresses the problem.